From small shoots, the Roscommon man built up his company, Class Grass, which now supplies schools, crèches, gyms and homes across the country. Cuddy says he was asked by family and friends to make more of these toy fields for their children, and soon he began to think that this could become more than just a side project. After Christmas 2014, Cuddy says he started taking the project “a lot more seriously”. 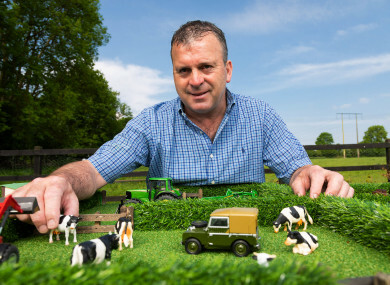 He designed a miniature toy field based on his original prototype, using artificial grass with hedges and wooden gates, and space for children to add their own farm toys. That was an incredible experience. We’ve had some great moments with the business but that was such an early vote of confidence for us. Class Grass is still our core business – The Field started off as a small part of what we’re doing, but we’ve developed it more in recent years. Since launching The Field three years ago, Cuddy says he’s sold in the region of 20,000 toys, but with his expansion plans, he’s hoping to hit more than 10,000 this year alone. With plenty of competition in the toy sector, Cuddy says he thinks The Field has been successful because the simple idea has resonated with children. It’s nice to think that an Irish company can build a brand worldwide with a simplistic toy. That’s our hope and we wouldn’t have gone into the States unless we felt that we could do it. Email “‘When RTÉ wanted us on the Toy Show, I rang my wife and cried down the phone’”. Feedback on “‘When RTÉ wanted us on the Toy Show, I rang my wife and cried down the phone’”.